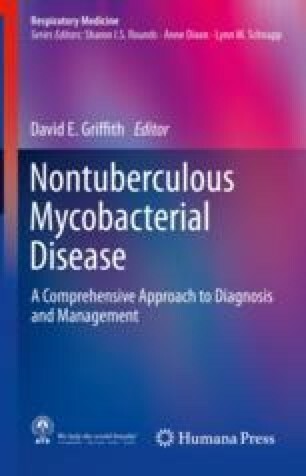 Drug susceptibility testing of nontuberculous mycobacteria is an important tool to guide and optimize treatment of these severe infections. Its role has long been controversial, owing to perceived discrepancies between in vitro susceptibility of mainly Mycobacterium avium complex isolates and the in vivo outcome of treatment. These discrepancies related to classic antituberculosis drugs (rifampicin, ethambutol, isoniazid); the role of these drugs in the treatment regimens is merely to prevent macrolide resistance, and their antimycobacterial activity is thus less important to treatment success. Results of tests for macrolide, aminoglycoside, fluoroquinolone, tetracycline, and oxazolidinone antibiotic susceptibility are known to predict outcomes of treatment with combination regimens containing these agents. This chapter provides a summary of known resistance mechanisms and a historical overview of susceptibility test methods and achievements, focused on in vitro-in vivo correlations derived from clinical studies. Lefebvre AL, Le Moigne V, Bernut A, Veckerlé C, Compain F, Herrmann JL, Kremer L, Arthur M, Mainardi JL. Inhibition of the β-Lactamase BlaMab by avibactam improves the in vitro and in vivo efficacy of imipenem against Mycobacterium abscessus. Antimicrob Agents Chemother. 2017;61. https://doi.org/10.1128/AAC.02440-16.